For the past 15 years, the Reverend Steve Woody has led the youth of FUMC Livingston through a highly intentional, nine-month confirmation journey that culminates with a Passover Seder. Each year, the confirmation process begins with the start of school in September, and ends the following May on Passover Sunday. 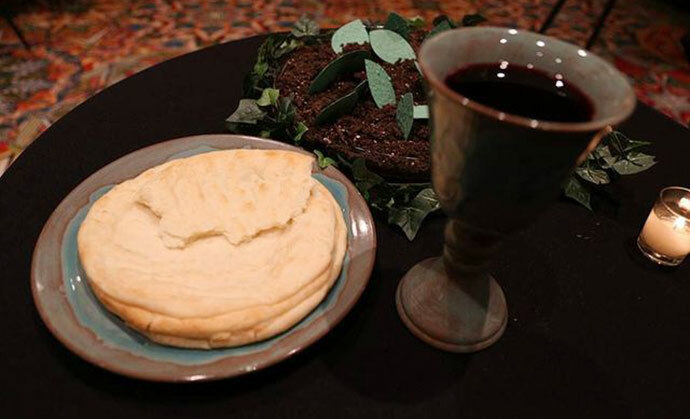 “It is very important that kids understand that the sacrament of Communion began with the Passover Seder,” said Senior Pastor Steve Woody. Over the course of the nine-month confirmation process, the students participate in a wide range of activities and lessons that are intentionally structured to help them deeply understand that we are “saved by grace.” (Ephesians 2:8) In addition to times of formal teaching, confirmands attend a variety of worship services, assist in Sunday worship in their home church, and participate in three separate retreat experiences under the close guidance of children’s director, Sarah Asiala, and youth director, Alain Leistkow. The final session, on grace and the sacraments, is taught by Woody. This session takes place in a weekend retreat in which the confirmands spend the night in the church. It is also the night of the Seder. After providing the confirmands with an overview of Communion as it is practiced in the United Methodist Church, Woody leads them into a room that has been prepared for the Seder. Candlelight illuminates a beautifully set table where confirmands recline to feast on lamb, matzah, bitter herbs, and bottles of non-alcoholic grape juice. Woody takes them through the Seder experience and explains to them how the sacrament of Communion was founded on the night of Jesus’ last Passover meal with his disciples. Following the Seder, and over the course of the weekend’s retreat, Woody spends an extended period with each confirmand to question them about their faith. He wants to ensure the Gospel of grace is firmly taking root in their hearts. Over and again, he finds the students offer thoughtful, Biblically rooted responses to his questions. Perhaps the surest evidence that the confirmation process is a success is the fruit it is bearing in the lives of the confirmands. To Woody’s delight, they are sharing their experience with their families and classmates. Their enthusiasm is leading their classmates and parents to church and into the arms of grace.